Sangria the classic from Spain, keeps in the fridge, covered with cling film, for a couple of hours – any longer and the wine starts to oxidise and the drink loses its freshness. Serve on ice, if you like. Pour the juice of 1 orange plus 1 small glass of brandy into a large jug. 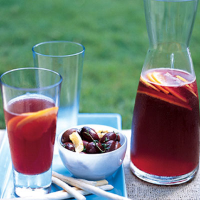 Stir in 1 tbsp caster sugar and, when dissolved, add 1 bottle of chilled, full-bodied and fruity red wine, and orange and lemon slices. Top up with lemonade – anything from 37.5cl (half the quantity of wine) to 75cl (equal quantities with the wine), depending on how strong you like it.